So, remember when the Romans salted the earth? Just kidding! I have a little more to say about it than that. If you start looking up natural weed killers, you’ll find all kinds of good stuff. There’s also a lot of discussion as to which ones should be used and shouldn’t for different applications. I’ve been trying a whole bunch of them out and I’ll be sharing some of the best ones I’ve used over the next little while. The idea of using salt appealed to me because it’s so darn simple and so darn cheap too. And it really works! Check out my front pathway. Don’t worry. I’m thoroughly embarrassed. We’re in the process of removing all that pink rock from all the garden, so it’s pretty much everywhere right now. And there’s a golf ball there for some reason too. I hope that doesn’t mean that Chris was hitting balls at the house. But look! Here’s the after! Good and dead. Most of that white powder that you see is actually Borax, which I’d tried a few weeks before and just never swept up. It didn’t do a thing for my weeds. Of course the weeds still need to be pulled out, but now they come out as one piece instead of breaking off and re-growing. I can’t believe I never thought of this these last few years as I’ve been trying to keep up with these weeds. I just can’t believe it! So you want to know a little more about this salt trick, don’t you? Well, how quickly and how effectively it works depends on a few things. It works by completely dehydrating the plant, so a nice hot sunny day really speeds up the process. I tried this during a hot spell and it worked in less than 24 hours. This patch that I’m showing you now took about 5 days because it was a little bit cooler and more overcast during that time. It still worked, but it took some time. Of course it also works better on certain weeds compared to others. You really do need a few different tricks up your sleeve to kill all your different weeds, but luckily I’ve got some of those in store for you soon. Salting only takes 20 seconds though, so it’s worth a shot if you’ve got a walkway that looks like mine. Where we live, the climate is quite humid, so the salt really clumped up and stuck exactly where I put it, but if it’s dryer where you are, you may want to sprinkle the ground with some water first so the salt doesn’t blow away. Something else you should know: This salt trick is a little controversial in the organic gardening world according to my reading. If you over-salt your yard, then you risk the salt leaching into the ecosystem and harming all kinds of plants, animals, and water systems. My thinking is this: Harmful chemical weed killers do that anyway, but they’re also harmful to you. At least you know that salt is safe for your family. Use the smallest amount of salt possible. Start with just a pinch at the base of the plant on a sunny day and see what happens. Never salt in an area where you hope to have things grow in the future! That’s why it’s also a weed preventer. Nothing will grow again for at least a little while in the areas where you’ve used salt. It’s perfect for those driveway cracks and pathways like mine. So what do you do about those weeds that don’t react to salt or that are in the middle of a garden? Stay tuned! I’ve found some great solutions to those too! *update* You can check out my magical natural weed killing potion here! These ideas might come in handy for you too! Well, I think I shall have to try this! Thank you for sharing… I sure hope it does the trick on our patio… I spent all last Sunday carving away weeds between the pavers; only to see the darn weeds have already returned this weekend… geesh. Have you tried Vinegar? 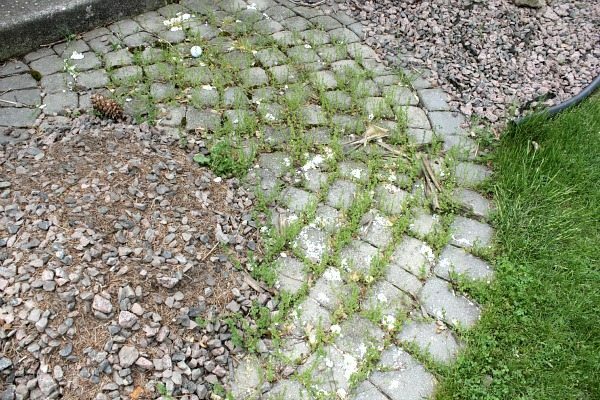 Vinegar works wonders for many things including killing weeds and ants. Oh, you are speaking my language .. anything to make my yard work easier is a winner in my book! Great tips and I’m going to have to give this a try. Thanks, Courtenay. Gonna try it…and I’m waiting with baited breath for the next installment! I am going to try it this weekend on my driveway. All those pesky weeds coming up the cracks are killing me. You are the queen of “why didn’t I think of that? !” Definitely going to try! 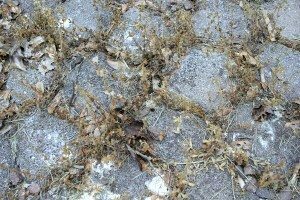 slugs and weeds- it’s a double dose of death! You bet I am going to try this girl..thank you. Have you already done the post about weed killers for in the garden? Our flower beds are COVERED in weeds. We won’t be planting anything in there so I could probably use this method anyway. We don’t have green thumbs so we are just gonna throw mulch down and call it a day. I’ve tried this before and I know it DOES work, but if you live in a more rural area you should be aware of the possibility of attracting animals with your salt. Yep, it happened to me! 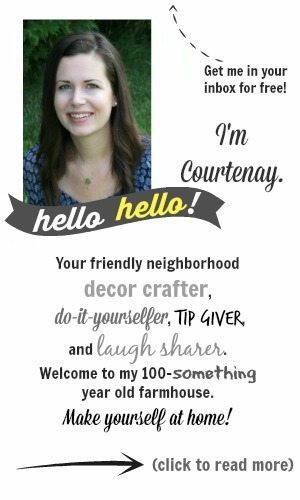 Great tip, Courtenay!! We need to do this between the pavers on our back patio ASAP!! Pinning! Hi Courtenay, I was wondering if it may work because white vinegar works pretty good, I wonder if we melt the salt in the vinegar water and spray the weeds, if it would work well.. It seems like it would.. I can remember my dad doing this to control the weeds around the cheese factory when I was a little girl. I’ve used salt for weed as long as I can remember. So easy, one ingredient! I don’t have as much area as you, but for small areas I just use a teakettle of plain old hot water. I have always boiled water in a tea kettle and pour it on the weeds when it is the hottest part of the day…Works really well. A few might come back, but if you do it a few times they really do go away for the season! This method doesn’t hurt the soil as salt does. 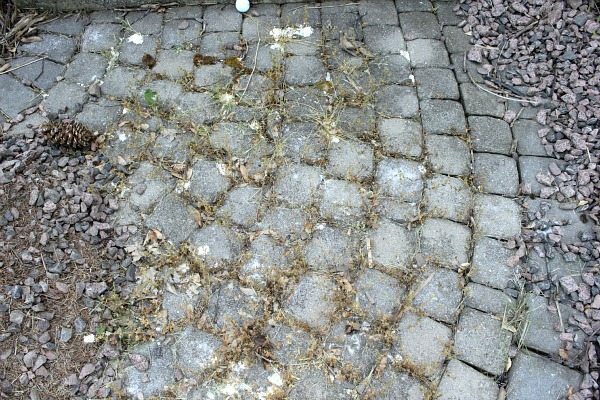 Keep in mind that any of the salt that blows or washes over to the lawn will also kill the grass. Great tip! Would love to have you share your post at our Ladies Only Blog Share link party. Our theme this week is summer! Visiting from What’s Shakin’ hop! wow! who knew? thanks for sharing! I was just weeding today and really HATE it!! I will put this on my driveway tomorrow! Cannot wait to see the one for in the garden and around plants…need that one too!! Using salt,vinegar,round-up,hot water,blow torch,etc, all have their good and bads, be cautious and try to remember for future use what applies to this area for the next year. Cause what you put here today will effect this area for about a year or more. Kids and animals, insects, birds,all are affected by our use of all things outside. I hate weeds also, but mechanical pulling hurts nobody but one selfs aching back and isn’t that the feel good work in ones garden? So simple, no chemicals, and cheap and easy! I wish I had known about this before. I will be trying that soon! Thanks! My Mom taught me to use salt about 60 years ago. At the beginning of the season I put it along the fence, rock walls and around the mailbox post. Really saves on weed whacking. just becareful using salt around concrete. salt destroys cement. We put in a creek bed of sorts and other than muck, all that grows is weeds. We did the salt and it worked like a charm. Well, with the size of this area I got to thinking….what about pool salt?…Woo Hoo! works great, and the larger bag size is great for bigger areas. round-up is killing bees. Without them you will not survive on this planet. Ha ha! That was great! You cracked me up at first! Brilliant! Thanks for sharing. : ) Have a great week! I’m going to try it — I’m curious though, does it really prevent weeds (or anything) from growing there again? For how long? Sounds perfect for my gravel driveway! We use bags of salt pellets on our driveway, cheap and can cover large areas. We had poison ivy that would not die not matter what I put on it. I ended up using left over sidewalk salt from the end of the winter on it and it killed it! You do have to be careful to keep it away from plants that are nearby, but worked like a charm! Oh wow, Lynda! That’s really good to know! I didn’t have my usual supplies for making my natural weed killer stocked up yesterday so I was eyeing up the bucket of sidewalk salt and wondering if that would work too. Maybe I’ll actually give it a try now! Thanks for sharing this. When it comes to gardening and landscaping, the green solutions are often the least expensive and most efficient solutions. In Canada we have a store called Lee Valley Tools. They sell a torch that attaches to a small propane tank. Once a week, I just walk around and give the weeds a quick blast. They’re gone in no and no worries about future plantings or leaching. Great tool. using salt will render the dirt unsuitable for any growth indefinitely, so be very careful where you use salt as a weed killer. Remember that the Romans plowed salt into Carthage’s wheat fields to wipe them out—and it worked. Nothing much has grown there for 2500 years…. Round up actually is less caustic than salt, breaks down pretty quickly. “Natural” can be deadly…. Please send me the recipe for weed killer. Hi Norma! The process is all explained in the blog post above! It’s really just as simple as applying the salt to the weeds and waiting! This is great! I’m an avid gardener and have never used it before until now! This really works, just make sure your not gonna plant anything there for at least a year. Great tip!im looking for something green to spray on my lawn to kill the weeds and won’t harm the grass. Any tips would help! Thanks! Love your site. I live near the beach. Every time my mum visited she put a gallon container in the car, and filled it with sea water to take home. She would use that as a weed killer, and it worked really well. It even killed kikuyu grass! She also collected some shell grit from the beach. Her chickens loved it! I have awful cracks in my driveway so I compared the vinegar/salt/soap/ & a lil water with just salt and water in the driveway. Both worked good. The vinegar doesn’t seem to have killed some of the grass stuff that is growing in it. However, I think the salt water solution did where I tried it. Mixing up salt water (1 cup to 1 gallon, kinda winging this) and putting in one of those garden sprayer things. Going out to spray grass now, and hopeuflly withing the next few days it’s mostly gone. You know, I actually think I might believe it! 🙂 I’ve been doing the same thing for years and I’m so happy to have found an easy solution that actually works! YES! Work great for me! After so many money throwing of to the window, yes a simple formula, that mother nature provide, work. NO MORE chemicals. Would the salt we use in the winter work or are u talking about table salt. 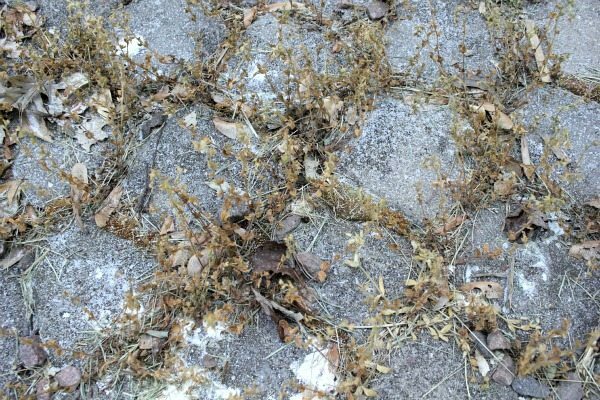 While this may work well for weeds, salt WILL erode, damage and destroy pavers and pavement. So if you’re OK with the cracks in your pavement increasing or ruining pavers, then by all means…. What about the accumulated effects of salt on the driveway? Vinegar works quite well, too. Beware of salt on concrete. It eats it away. Slowly, if you’re only using small amounts. Quickly if you up the dosage. Concrete will actually crumble away in an afternoon if you use way too much salt. I use vinegar. But I absolutely love the boiling water idea! Can’t wait for spring weeds so I can give it a whirl! Thank you. I will try this when the weather is good. 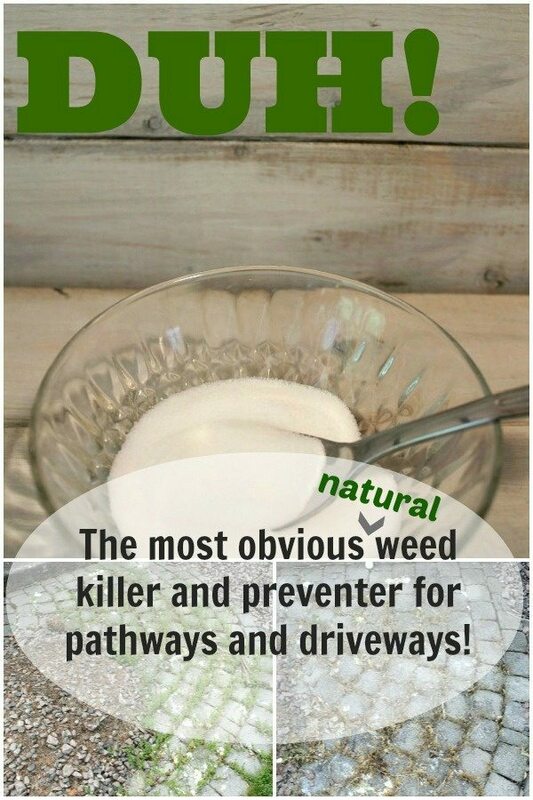 I have done this for years but am very careful it does not come close to my garden as salt kills the lot! But the best is in winter when I use my heat rod to burn the weeds on the path, so easy and takes at least until summer to come back! It runs on butane gas and has a long rod and you press button and voila, weed withers and gone and no salt to seep into the garden when it rains and spreads it! Well, I love the sounds of that! That just seems like it would be so much fun! I am so thankful for finding your post! I wet and salted the weeds coming up everywhere in my stone driveway. Some dried up the same day and some needed a 2nd application but they are all dead now. Just have to pluck them out and throw down some new stone. Over the past few years I have tried all kinds of expensive chemicals to end this ever growing problem – all unsuccessfully. Thanks for this affordable solution, especially for areas that are not meant to grow any type of vegetation. Yay! So glad you found this one helpful, Debbie! This is still my favorite method for our walkways these days. You just can’t beat it! Having a go at this . One word SQUIRRELS! How do get deter them ? I’ve tried cayenne, chilli’s and the old hot sauce routine and nothing seems to work . I can feel them all laughing at me ! Hi Alison! I’m hoping someone will see your comment and have a suggestion for you. Squirrels seem to live more in the cities around here, so we don’t have any out where we are. We do have a lot of bunnies, but they don’t seem to really cause much of a problem most of the time. Hopefully someone else has a great tip to help you out!